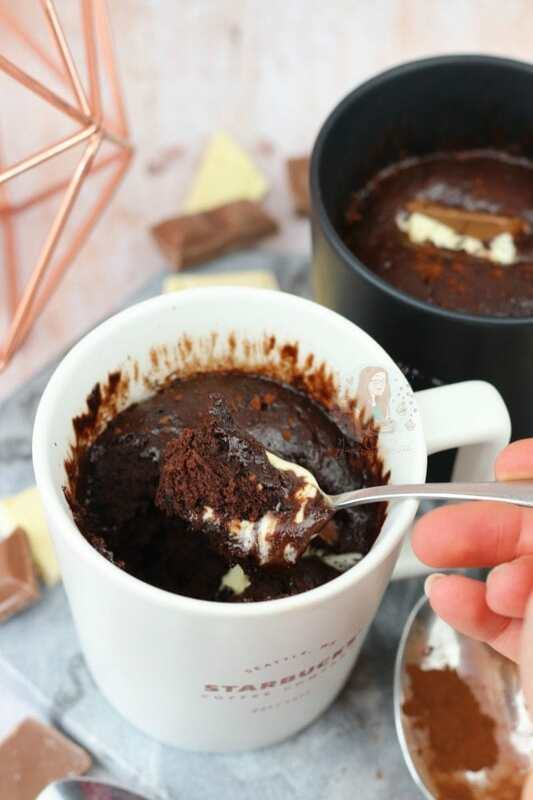 Easy and Delicious Chocolate Mug Cakes with a gooey centre that are ready in Minutes! So it’s an obvious thing if you read my blog, or look for recipes on here, that I adore chocolate… and cake. To be fair, I prefer cookies or brownies over cake in general, but sometimes thats just down to the fact that they’re easier to make. Therefore, I wanted to finally publish a recipe that is SO EASY that it’ll be rude for you guys to not try it. Honestly, six ingredients, no butter or eggs, and ready in less than five minutes. 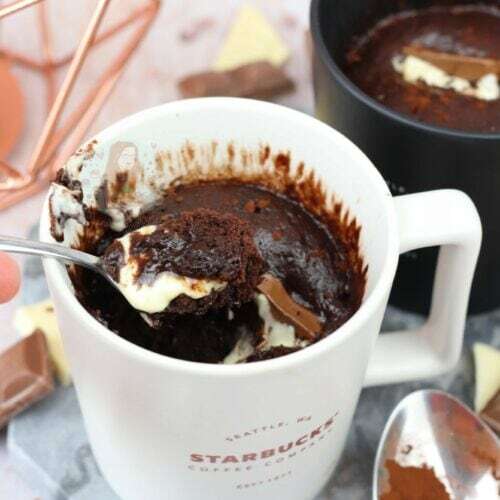 Hello Chocolate Mug Cake! 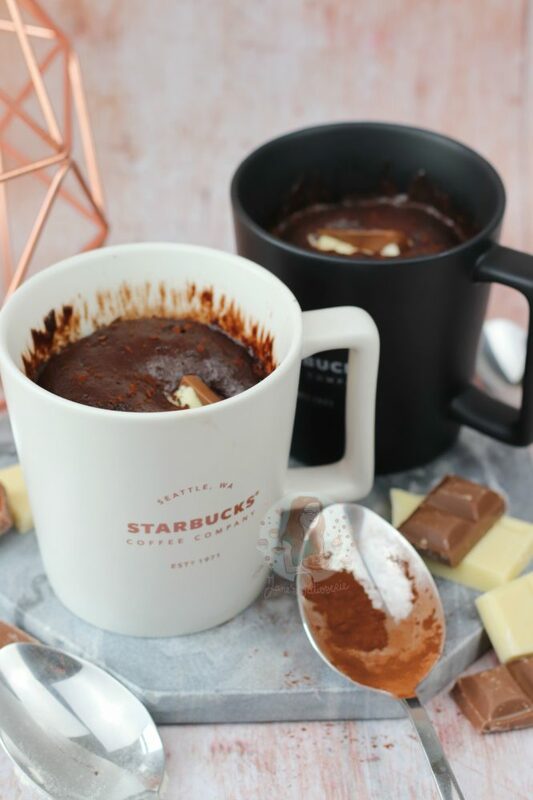 I’ve tried several mug cake recipes over my time, as they’re just so easy. When you want a slice of chocolate cake, and you either don’t want to bake an entire one yourself, or you don’t want to buy one. 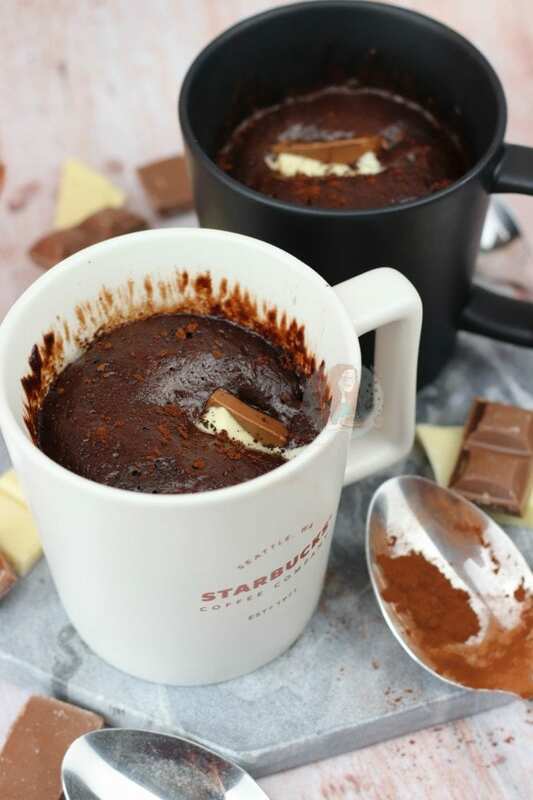 Literally, whisking together some ingredients together and microwaving the mug cake, and huzzah you have a fudgey, chocolatey and delicious treat. 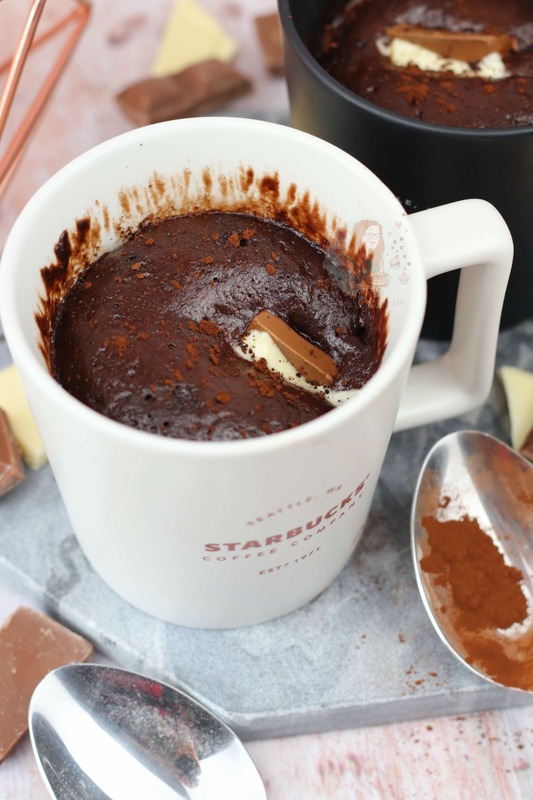 I went for chocolate for my first mug cake recipe, but don’t worry… I will be posting plenty more as the time passes! I decided to make two of them for the photos to have a little more impact than just one.. but the recipe is designed for just one mug. Obviously, you have to make sure that the mug you use, that it can actually go in a microwave. My boyfriend tried to make me one of these, and used one of my favourite mugs… but that went a little wrong. Let’s just say it had to go straight in the bin. But anyway, I used these cute Starbucks Mugs that I got from my local, and they were the perfect size! I tried this recipe with some baking powder, and it does work and make it more fluffy, but personally I wanted a denser and more gooey cake. You can add in 1/2 tsp of baking powder, but its entirely optional. I used Self Raising Flour as I preferred it to plain, and then thats enough raising agent for me. The measurements are a difficult thing I find because peoples versions of ‘one tablespoon’ can vary in weight SO VERY MUCH so I have put weights as well. 15g is typically a level tablespoon weight, so don’t do heaped.. it might not turn out as good! I did think that even though these cakes are so gooey already, that they needed a little more oomph. 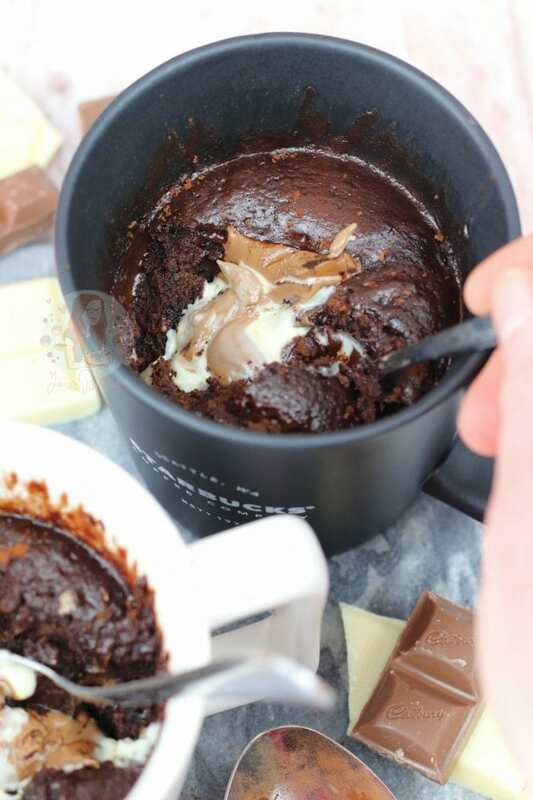 One of my favourite things at Easter was to add a frozen creme egg in the middle of the mug and it was so ridiculously yummy I couldn’t cope, but I never got round to posting it in time. So, as Easter is now long gone and all the treats are out of the shops again… I thought why not just use some actual chocolate?! I thought I would make mine triple chocolate style by using a couple of chunks of milk chocolate, and then also some white chocolate chunks. When microwaving the cake, these melt as well, and it forms a gooey molten centre that you can devour. One of the best things about this recipe? It can so easily be made dairy free, and vegan. Honestly, I’ve tried several vegan versions, and they’re just as good. The first time I started making these I was attempting to be dairy free to see if I had an intolerance, and I was heartbroken I couldn’t have one. However, soon after realising I already didn’t include butter, and my cocoa powder is dairy free… why not try a different milk?! 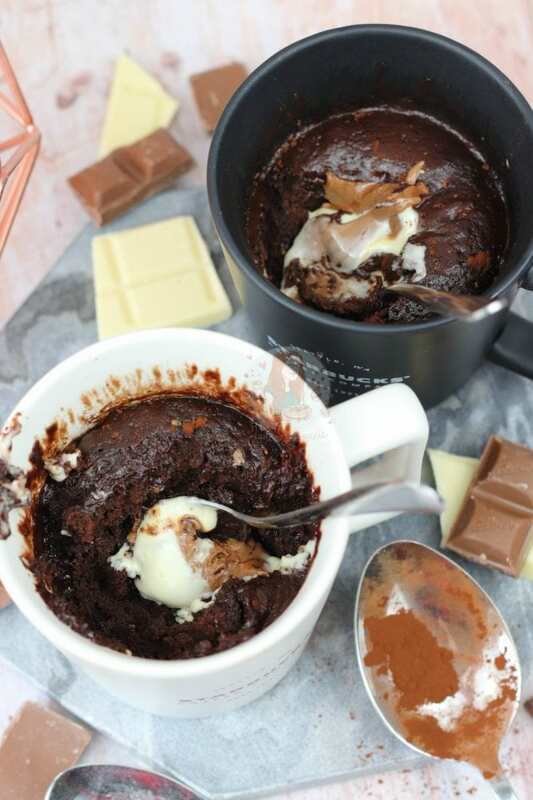 In a mug, add all the ingredients, apart from the chunks of chocolate. Add in a few chunks of chocolate into the middle. I used two pieces of white, and two pieces of milk chocolate. Microwave for 60-90 seconds. And enjoy! My microwave is an 1000watt microwave, and my mug cake only took one minute to do on full power. If you want to do more than one, add on 30 seconds or so if microwaving at the same time. Mine took about 100 seconds to do two. You can EASILY make this Vegan, by using Dairy Free Dark Chocolate in the middle, and using almond milk. Sometimes it can look a little gooey on top, or round the edges, but it is done! 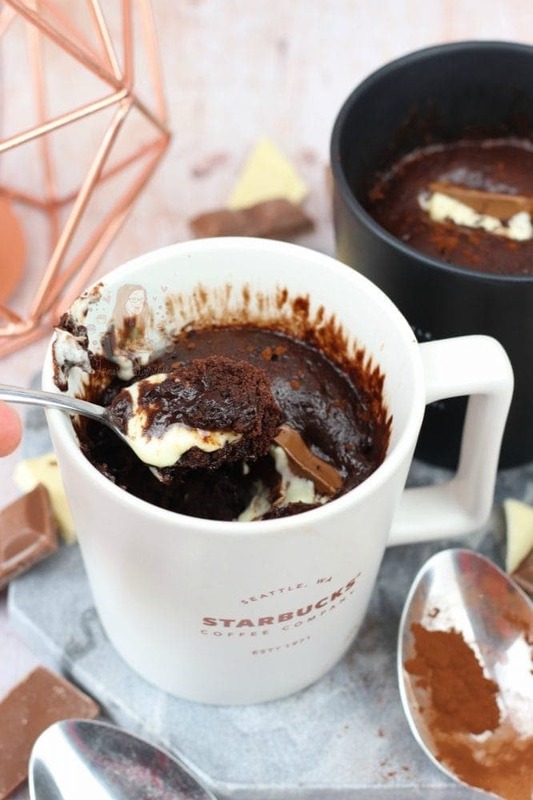 You can easily mix everything in a bowl, and simply pour into a mug to bake in the oven. You can add in 1/2tsp Baking Powder if you want it to be more light and fluffy, but it can raise up a lot more and explode over the edges! Find my other Chocolate Cake Recipes on my Recipes Page! Older Next post: Malteser Millionaires Shortbread! Newer Previous post: Homemade Caramel Sauce! I just made this recipe and i thought it was lovely! However my chunks of chocolate in the middle didn’t seem to melt 🤷🏽‍♀️ I put it in an 800w microwave for 70 seconds. How do i fix this next time? What chocolate did you use? Sometimes due to how microwaves can work it can just happen that way because of how they heat. Try smaller pieces of chocolate maybe so it needs less time. Or put the chocolate on top! Wow. These look so good. Quick question, how do you calculate the calories? Do you us a website/app etc? It’s part of the plugin that creates the recipe cards – its all from there.